Several players, when they start learning about some of the complicated strategies in poker forget about what they have learned so far. One of the most basic learning in poker is the starting hand, everyone who plays poker must know of the requirements of a starting hand, and must know which hands they should be playing and which ones they shouldn’t be playing. 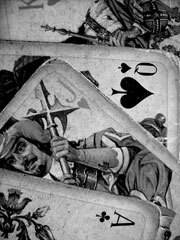 If, on a starting hand you are dealt with cards that promise to be a good hand like a AK, KK, JJ, AA or a QQ then you must go ahead with the cards and bet as much as you can, raise and re raise just to get as much money in the pot as you can. However, you should be careful of those opponents who play a tight game and would be raising on the pre flop unless you really have strong cards. If you have cards that are not as strong as the ones mentioned above, for example if you are dealt with AQ, KQ, QJ or 10’s and 9’s you would need to play a bit more selectively. If you are in the first three seats on a table of 10 you might want to bet or raise in hopes of getting the other players out but otherwise you would need to play conservatively. If you have cards like an 88, QJ, KJ or an AJ you shouldn’t play aggressively since you would still have to look for a connector on the board to get a better hand. These are left best for the later position in the game if your opponents have been playing mild and not raising, otherwise its best to just quit. Any other hands that are not mentioned above like 87, 76, 89 etc aren’t as good as the hands mentioned above and unless you find a possibility of making a straight or a flush on the board are not worth playing. Do check and proceed if it isn’t too much money to play, otherwise it is best to get out of it early. Unless you are playing the game for free online, all the other types of cards should be immediately folded if you have to check before you can see the flop. Raising on low value hands is not logical at all especially if you are playing a real game for real money. Practice a lot to master your starting hands and once you do that a lot of things would become easier for you in the game.